This beats the boxed stuff any day! Dice one onion. Saute in margarine until brown over medium heat. Take off heat. Rip one loaf of bread into bite sized cubes. Pour onions over bread. Add one egg. Mix. Add salt & pepper to taste. Sprinkle with seasoning salt. Stuff into turkey. This one is so good. Delicious flavor without all the fat of regular alfredo sauce. Heat garlic in milk. Add basil, salt & pepper and parmesan cheese. Mix well and heat thoroughly over medium heat. Be careful not to scald. Pour over noodles. Return to medium heat and stir frequently until sauce thickens to desired consistency (usually 6-8 minutes). Tastes great with sauteed shrimp or chicken tossed in as well. Perfect on a cool winter day. Warms you up from the inside out. Fry potatoes, onions and bacon. Combine with other ingredients in large pot until blended. Heat thoroughly. A real comfort food. So moist and delicious. I made certain they were served at our wedding brunch. Beat eggs; add sugar, oil and pumpkin. Beat well. Sift together and add dry ingredients, chocolate chips and nuts. Bake at 350 for 20 to 25 mins. 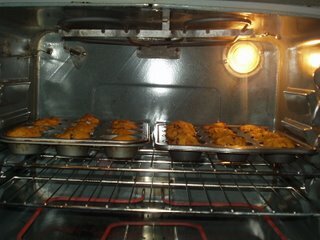 Yields 16 to 18 muffins. Freezes well. One of our all-time favorite meals. We ate it over and over and over again. I learned of this recipe about 2 years ago and I've made it alteast 30 times. SOOOOOO good. Saute garlic, chilis and ginger in 3-4 tbsp. olive oil or medium heat until softened, 3-4 mins. 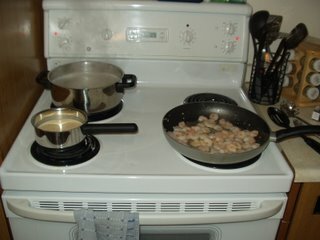 Add shrimp to heat. Squeeze lemon juice over top. Add a couple of tbsp. of olive oil. Serve over toasted bread. A favorite. Even Abby loves these! Mix all ingredients together, dredge in flour and fry over medium heat in oil for approximately 4 minutes per side, flipping only once. Don't flip them too early or they will fall apart! I'm going to start off the collection with a spice mixture that is a staple in my kitchen. It tastes delicious on chicken and seafood. I usually make a big batch of this and then just use however much I need for that evenings meal and save the rest in a container for later use. The more you use, obviously the spicer it is! I love to cook and more than that, I love to eat! I grew up thinking I was a terrible cook because I once made an angel food cake that was about an inch tall. I never went near the kitchen for years. I only wandered back in because, at the ripe old age of 19, I got married and well, my husband was pretty dead set on the idea that we should eat. I started making the basics. I think we had pasta every night for the first few months of our marriage. Then I introduced the chicken breast. Then seafood. It just spiraled from there. I started watching the Food Network and getting ideas. I began making up my own recipes and to my surprise- they were good! My husband, daughter and I all have a diverse palate so our menu is always something different. Of course we all have our favorite recipes that we tend to reuse, but I'm always looking for new recipes to spice up dinner time. I've never really known what I wanted to be "when I grew up". At the top of my list was always a journalist. Scattered below on the list were a cook, a teacher, a travel agent. I am so fortunate that my current position of wife and mom allows me to dabble in all those areas. I need to give some credit to my mom, my aunt Lyse, Emeril and Jamie Oliver because I will feature some of their recipes here as well.